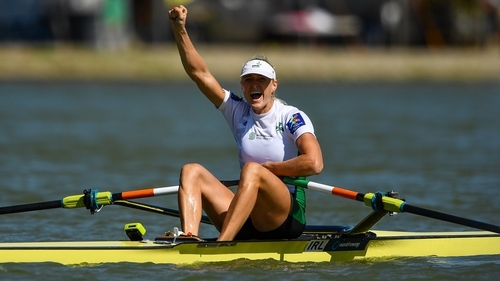 Sanita Puspure blew away the field in the women's single sculls final at the World Rowing Championships to win gold for Ireland. After years of disappointments, missing out on medals at major championships, this was a huge moment for the Cork oarswoman. The 36-year-old caught a buoy with one of her oars in the early stages, but she was relaxed throughout and it didn't appear to slow her down at all. As the fastest qualifier for the final, the Latvian-born, Cork-based Puspure was drawn in one of the centre lanes. However, high winds on Sunday morning on the artificial lake in Plovdiv, Bulgaria saw the lanes redrawn and she was moved to lane six, which gave her an advantage over her rivals. She beat Switzerland's defending champion Jeannine Gmelin into second with Magdalena Lobnig from Austria in third. Puspure was inspired by yesterday's success and her children watching on: "I still can't believe it in a way. I've been thinking about myself in the middle of the podium for the last week. When I was in my heat I thought I had a really good chance of doing it, but know that it made me more nervous because I'm used to being underdog." "It wasn't as smooth a sail as it has been. I was just like 'keep going'. "I found it really emotional yesterday seeing the boys win the gold. I wanted the anthem to be played for me as well and I can't believe it actually happened. "We have a great dynamic in the team and we all get on really well. That really helps." Puspure, so often just outside the medals, said that previous heartache had driven her on and admitted she was nervous despite a calm demeanour. She said: "That was the biggest fear. I'm so used to being disapppointed. I'm not used to being happy after races. This means the world to me, my family and team."